Park Shin Hye International Fanclub | 박신혜 국제 팬클럽: Shin Hye's Star Spangled Birthday - PSHIFC's Birthday presents debut! 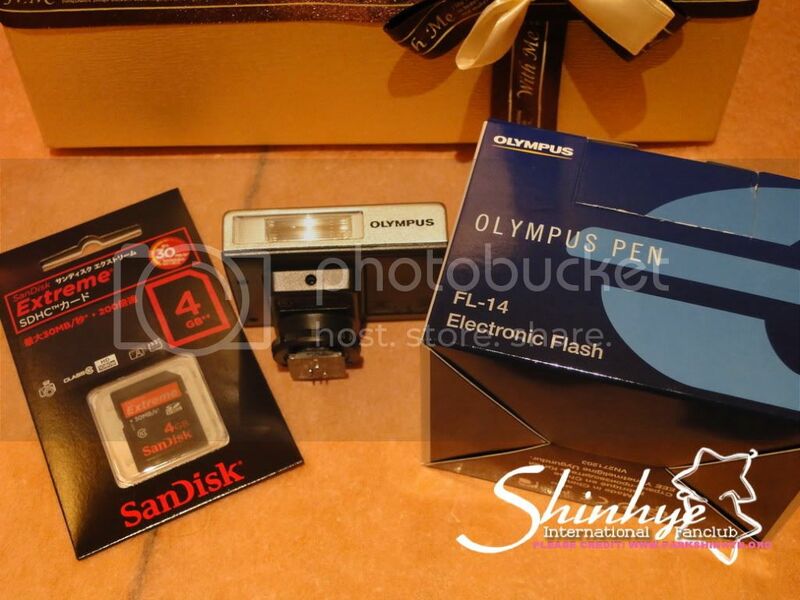 Shin Hye's Star Spangled Birthday - PSHIFC's Birthday presents debut! 고마워요. 난 참 복받은 사람이에요.. 너무 늦장부려 미안해요.. 고맙단 말밖엔 할수가 없네요.. 더 멋진배우가 될게요.함께해줄거죠..? Thanks. I'm very blessed. Sorry I'm so late. All I can say is thanks. I'll try to be a better actress. Shall we do this together? Along with this, she posted two pictures of presents she received for her birthday. Look whose presents made it to the photos! PSHIFC has done it again! 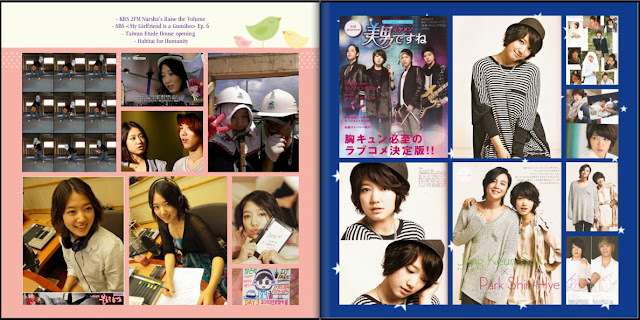 Scrapbook containing all members' birthday cards, the star origami which were collated to fill a star origami glass jar. We have collected more than 5000 stars. This book records all the events, photoshoots, fanmeetings and filmings Shin Hye did in 2010. This book records all the activities of PSHIFC since its opening in December 2009. 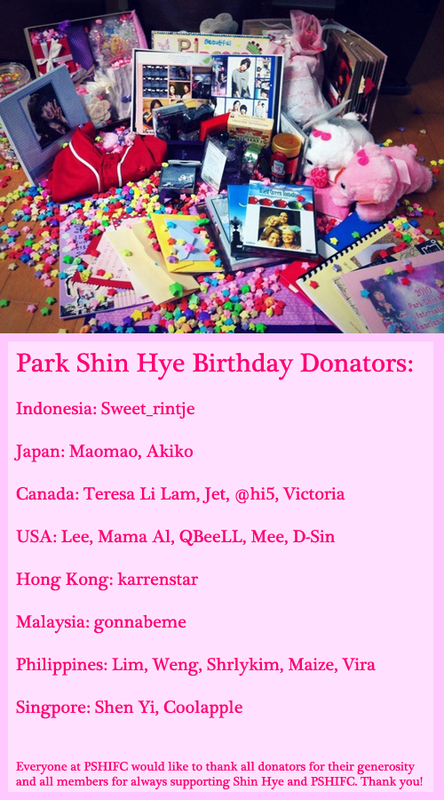 Some members also helped us raise money to buy presents for Shin Hye. Here are all the stuff we were able to get for her with everyone’s contribution. As the old adage goes: We cannot spell SUCCESS without U! The 2011 Birthday Project has been splendidly carried out because of the unwavering support of all the stars angels all over the world. As our star brings her supporters closer together through her love and appreciation, PSHIFC will carry on with our promise to bring you closer to our star. I love PSHIFC and it's members! Thank you so much everyone. This couldn't have happened without all of us working together! It's exhilarating to see our presents and stars everywhere! So happy Shin Hye got them. Couldn't sleep at all. hehehe. This is wonderful! And yes, Shin Hye, let's all do this together! Great job everyone! omg..thank you so much to all star angels members and admins..this is really amazing and beautiful!!!! !i was teary-eyed while reading and viewing the pics..it's soooo beautiful! !i can really feel the love for shin hye represented on all those gifts:)) i'm so thankful and proud to be part of this wonderful group.great job guys! !thanks to all your efforts!! Admins and members..you should be proud of yourselves. Everything is so beautiful and made with so much love. Am sure SH felt all the love when she received the gifts. chukahaeyo!! thank you for making a beautiful birthday for a beautiful birthday girl.